Please feel free to contact Mark Chapin, Principal at Meyer Middle School if you have any questions regarding the Character Education initiative in the River Falls School District. The River Falls School District Character Education Steering Committee has been meeting nearly every month since June of 2010. Our goal as a committee is to generate ideas and excitement as we continue to promote character education throughout the River Falls School Community. Click on the PDF below to learn more about our foundation for character education in the River Falls School District. 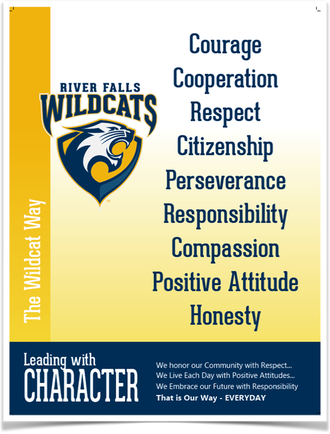 LEARN MORE ABOUT OUR CHARACTER EDUCATION JOURNEY IN THE RIVER FALLS SCHOOL DISTRICT . . .